I am financially conservative. I know that sounds funny coming from someone who gets and uses credit cards and gets 10-20 cards each year but there is the issue of spend. In my “Rookie” tab I plainly state you “DO NOT buy things you do not NEED”. 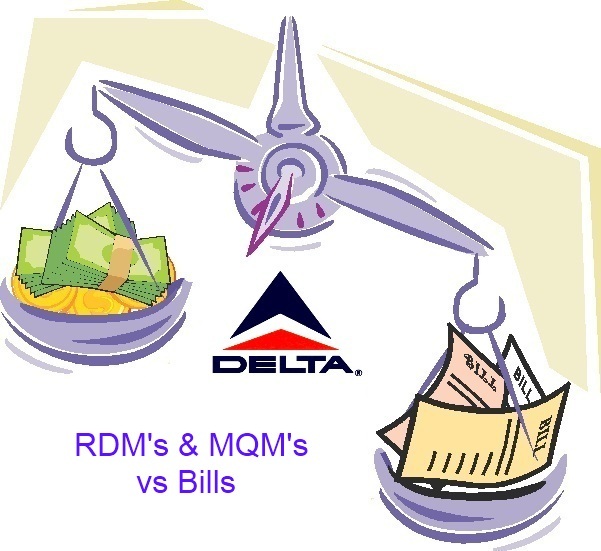 So how can I do this and meet my goal to get to $60,000 in spend on my Delta AMEX Reserve card to get 30,000 bonus RDM’s & MQM’s for the year. The answer is simple but will require dipping into savings for a few months. We all have monthly bills like our phone, cable, gas, electric, food, etc etc. Have you ever thought about prepaying for a 3-6 months these bills? Now keep in mind I am giving up some points as using other cards WILL earn me more points but short term I value my MQM’s more than the points I am giving up. Not only that, there are some small fee’s I will pay to pay some of these bills with a credit card. Check out what I have done as I still need to spend $10,000 by year end. $500 – My cell bill. I paid it and prepaid $500 more. $500 – My Comcast bill. I paid it and prepaid $500 more. $6500 – is my grand total so far. My gas and electric companies don’t take AMEX and the fees to buy VISA & MC gift cards are too high (my local Officemax ended my fun of buying them with OfficeMax gift cards). There are other things I may send some money to. Ebay will let me pre-pay and I do sell stuff for about $50-100 in fee’s each month. I could also buy a gas card but I already have my $3000 AMEX gift card for that. I already pay my homeowners insurance with my AMEX card in full so that one is done (I use Ameriprise as they are the cheapest and take AMEX). There are some words of caution with this. The biggest is only do this if you have some savings you can tap. YOU DO NOT WANT TO CARRY A BALANCE on your credit card. Just not ever worth it. Next, if you plan to later say buy an iPad or TV with a AMEX gift card – DON’T. If you do buy these things with the DELTA AMEX you will in most cases get an extra year warranty from AMEX that you will not if you pay with a gift card. Also you will miss out on some interest from taking money from savings to cover these prepaid bills but since my budget will be much smaller for the next few months it will be simple to put funds back. Again, worth it to me for the points I will get. You may NOT comment just buying a TV or a Computer etc. The idea must be for things we normally pay for that we can pay with AMEX card (buying Visa & MC gift don’t count)! You can not use the ideas I have already posted above. Since I am looking for real payments, Amazon payments etc don’t count. If two people comment the same idea (like buy a gas card – the one who comments first counts). You may comment more than once if you you have more than one idea for us. I am the judge of this and my decisions are final. I will then use Random.org to pick from the approved list a $50 Marriott gift card! Make some loans on Kiva.org! It’s a great way to help others and you’ll get a large portion of your “investment” back in a few months. Some charitable donation sites accept CCs. You could also take advantage of buy/share miles promos to top off accounts at reasonable value. Since you are giving away a Marriott gift card, you might as well get some more. This is effectively prepaying another of your bills (hotel stay) and you can still earn Marriott Rewards points on your stays even when paying with the gift cards. And…to make this idea even better, Delta, United, and Southwest are all offering bonus miles for Marriott gift card purchases right now. Start a side business and generate new business expenses. Correct me if I’m wrong but you don’t currently offer a ‘booking service’. You could start one and generate new expenses that way. Bookings must require paying for taxes and surcharges. Those would be perfect expenses to put on a card, which your service fees would recoup. Obviously the ‘booking service’ business is not for everyone, but the general idea of generating new expenses remains the same. Or do the pedestrian thing, and take your friends to a mid price restaurant, split the bill but you pay in credit and pocket the cash. Starbucks and Dunkin Donuts both have apps. Whenever I need to meet a min requirement, I just add to both of those accounts. Also, some gyms will let you pre-pay as well. Join a Meet Up and go our for dinner, movie, theatre etc and offer to use your credit card to pay. Others will pay you cash. If desperate, wait by the gas pump and if you see someone using cash to pay for gas, offer to use your Gas Gift card. The better question is how you’ll hit $60,000 next year after you prepaid everything. 🙂 I’ve thought of prepaying myself but $5,000 this year most likely results in around $5,000 less spending next year. End of the year is a great time to complete reimbursable medical savings account spending. Depending on how your account is set up, you can pay doctors/eye care/chiropractors/aura manipulators with Amex, then submit for reimbursement from your already prepaid funds. Paying property taxes, or estimated income tax. I know this violates your T & C, but if you absolutely need the spend to get the MQMs it’s worth it (in my opinion) to make a quarterly tax payment through Official Payments, EVEN if you don’t think you’ll owe any tax. The cost is 2.45% & they accept AMEX & if you don’t owe any more tax you’ll get the money back as a tax refund. The MQMs are worth way more than 2.45% & it’s better than spending money on some product you don’t really need. Prepay for gym, airlines or other clubs. I would second paying charities. Buy gift cards for common spend items through a secondary vendor like gift card granny or who ever. See if you can pay ahead on a car payment via credit card. Pre pay for an upcoming vacation like for a cruise. Buy Christmas or other holiday gifts. Aunt Betty needs a honey baked ham and uncle Fred or a business associate might need some cheese and summer sausage from Swiss Colony ( of course buy those through a points or miles portal). Buy pet food a couple months ahead in bulk from an online miles or points portal. Stock up on common drug store items from an online points or miles portal (we all need soap, toothpaste, etc). See if you can pay for year end items like local or personal property taxes or home owners dues via credit card. I’ve been able to boost spend to meet a threshold by pre-paying my tolltag account online. Of course, you’ll only want to pre-pay what you will use in a reasonable amount of time. Buy small denomination Amex gift cards now with no fees. Give the gift cards away at Christmas to those service providers that you always meant to reward/thank for their service all year. I would consider buying Christmas present now. You could get better deals, possibly buy something the receiver would like more and it would be less stressful than waiting until the last minute. Have you thought about writing your will. If not you should and you can pay for the lawyer or buy a form online. The latter will not cost as much but my not be as complete. Sign up for Amex’s Small Business Saturday (do this soon), order extra Amex cards for authorized users of your account, then buy $25 gift cards at small businesses included in the promotion, one for each Amex or authorized user with a unique card number, and Amex will give you a $25 statement credit for each small business purchase. You end up with a free $25 gift certificate for each Amex card with a unique card number that you have. My last comment got me on a roll. I do not mean to sound morbid. How about buying your funeral plot and prepaying all the expenses so your family will not have to pay for it? Are you making any hotel stays or taking flights anytime in early 2013? Could you buy gift cards to those hotels/airlines (I’m assuming airlines have giftcards, I’ve never checked). Buy the cards now, use them in the new year! You should offer to purchase all of your friends’ and family members’ Christmas presents when you travel and then get reimbursed in cash! 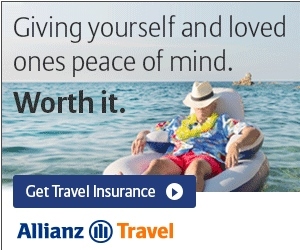 I’m sure you’d make their life by taking the hassle away and bring them back some “authentic” gifts from the various destinations you will be visiting in the next couple of months. Know anyone getting married or having a baby in the new year? Be the first one to send them a gift (or just order it now so that it you’ll be ready to give it. Bonus points iftthey’re registered somewhere on the skymiles shopping list. Hunt for Free after Rebate items at Staples, Tiger Direct, Walgreens has had some lately, etc. Sure you have to float the rebate, but it is free spend and you don’t cannibalize your 2013 spend. Haven’t been any of those nice big ones from Staples lately but I’ve been able to get about $2,500 in “spend” for nothing through the year. Mark’s prepay taxes above is a good one (even if it violates your fee T&C) – and one I have been keeping in my back pocket to meet my 50K on the Plat. Might need to do 3-4K in a payment and get it back early March. Certainly can be worth it when MQM’s are at stake. Over pay medical bills. Intentionally overpay with your credit card! Hospitals and medical offices will cut you a check for your refund. Some facilities allow you to pay online. or you can just mail in the more taditional payment stub. Downside, is that it may take a while (6-8 weeks) to get your refund. they will issue a refund quicker if you call and bug them alot. secondly, if you have any outstanding balances, your overpayment will be applied to those accounts before you get a refund. I met my minimum spend by donating to charity; buying Christmas, birthday, hostess, and other gifts; purchasing gift cards (especially restaurants in the AMEX twitter promo, but also for lcothes, etc. my family needs; purchasing mulch, fertilizer, etc. for the next season; and paying medical, dental, and Rx co-pays (take your Rx to a location that gives you money back for new or transferred prescriptions). I’m prepaying my daycare expenses to fund my minimum spending requirements. The day care only takes debit cards so I have to use my Amex to buy gift cards to do it, but for the purposes of meeting my minumum spending requirements, it’s worth it and opens up thoussands of dollars of spend per year. If you’re church or local food pantry prefers to receive food donations rather than cash, you can buy the food with an Amex, or buy the wal mart gift card and use that to buy food if you’re buying it from Sams Club, and then get an in-kind donation letter from the church or food pantry, staple the reciept to the letter and get a tax deduction for your donation. Go to your fav local Skymiles Dining spot and buy some prepaid giftcards for it! With Thanksgiving, Christmas and the holidays, as well as cold, difficult weather for many, there is an increased need for shelters and food pantries that distribute food to the needy. You could use your AMEX to purchase food and other necessities and donate them to these worthwhile cause, being a blessing to many others. Fruit of the month club from Harry and David or other monthly consumables club for an item you already use (Vinesse?). Or a large Omaha Steaks order assuming you have a chest freezer. Usually also great bonus points through shopping portals. Do you have any family members who has a big purchase coming up? I purchased some things for my parents (travel most often) when I needed a little extra to meet the spend and had them write me a check. I pay State Farm auto insurance with credit card. No extra fee. If you heat your home with oil, get your fuel tank filled. Another suggestion which I have used in a pinch when I was out and needed cash but didn’t have any way to access cash (I don’t carry an ATM card and the hairs on the back of my neck bristle at the thought of fees and interest charged by cards when you take a cash advance). I have made a purchase at WalMart using my AMEX and then going back later (or immediately) to customer service, returning the item and requesting cash for the return instead of it being credited back to my AMEX. So far, I have been mostly successful with this – only rarely was I told that they could only put the charge back on the card. Not a ton of extra points, but still adds to the count and can get you needed cash in hand in a pinch. If you live in (or travel to) snow country, check the condition of your winter tires; do you need to replace them this year? Is your vehicle due for a service? Have monthly orthodontist payments? Make a bunch of payments in advance. Pre-pay your annual professional licensing dues. Sending your kid to summer camp? Pay the balance now. Most are refundable until a few months before camp in case your plans change. Are you planning to go to any concerts, shows or sporting events in the next few months? Buy your tickets now. If you have the service, satellite radio is another normal bill can also be paid by AMEX. Paying for a year service in advance also saves money versus monthly or semi-annual billing (11 months for the price of 12). As a bonus, if you can add a radio to an existing account, pricing is about a 17% discount. This can be utilized by giving radio service as a gift to someone else, or adding your radio service to a friend or relatives account. If eligible (state specific residency requirements), you can start investing at Lending Club and/or Prosper.com. Lending Club specifically lists funding your account via PayPal for up to $5,000. You can use credit cards through PayPal. Based on your activity with LC, this could be a money-making enterprise, not just a way to meet spending requirements. prepay my ADT alarm service! Prepay for either your homeowner’s insurance or your renter’s insurance, whichever is applicable to your situation. Sign up for a heating and air conditioning annual service contract. If you regularly pay to have your furnace or AC serviced anyways, you might as well bundle it as part of a yearly plan. Many hvac companies offer these plans and offer discounts for the contract and percent off repair if you have a contract with them. I typically go on 10 cruises per year. I have a friend who enjoys the casino floor on cruise ship that he doesn’t mind using my credit cards while onboard. He plays so much that the one cruise line doesn’t charge a “convenience” fee of 3 percent while the rest of us, pay. He is able to get up to 2,000 dollars per day of withdraws so its an easy way, for me, to met the maximum bang for a buck. It gets charged like a regular charge, so I can redeem the points for future travel. This is what I am doing to hit my $3000 mark. I work in the IT industry and have people coming in from different countries for short-term. Normally they travel with a Visa travel card. Many wish to buy iPads, Cameras or Laptops. I volunteer to let them use my card to buy the items and they pay me later. Of course this will only work if you have absolute faith on the person. last year i got my last 1k in amazon gift cards at $50 ones and used them for gifts all year. they send them for free in pretty boxes and i would have spent almost all that on gifts anyway. If you take any prescription medications and have prescription coverage, dont use it! Instead pay outright and then submit to your insurance for reimbursement. Set up the first ever Boarding Area DO and pay for everything yourself. Randy can reimburse later! Go to places like Plastic Jungle and buy Starbucks gift cards at a discount and empty the cards into your existing Starbucks account. Paul S- what kind of gift card are you buying that allow debit transactions? All the ones I’ve seen don’t have PINs and can only process credit transactions. Thanks. Buy some plane tickets from Delta to go to even more fun places! Buy gold coins from the United States Mint. Gold has been a great investment the last few years and is hedge against inflation when Delta decides to hike ticket prices. Go out for food with ppl. Pay in card and have them pay in cash to u. How about booking a fully refundable ticket or two from Delta to a random location? With your status, you won’t have to pay a hefty fee later to change it to wherever you decide to go. If you are a skier, you should think about buying a Mountain Collective Alliance Pass before Nov. 19th for $349 which includes two day passes for each of the following resorts: Aspen/Snowmass, Alta, Utah; Jackson Hole, Wy; and Squaw Valley/Alpine Meadows, Ca. Plus, you get 50% off lift tickets beyond the 8 free ones. Use it to purchase day passes to airport lounges where Delta doesn’t have a presence. Not sure if this meets the T&C, but you could buy gift cards to your favorite restaurants. Put a deposit on a cruise (or two); you might end up going anyway and, if you not, usually you can get a refund up to 90 days before departure. what about other bills? Power? Water? Internet? can you pay these on your credit card? If so pay it forward! Ok, rent and mortgage payments are regularly mentioned as opportunities for CC spend. Here’s the twist – Home Owner Association fees. My HOA uses BB&T to process payments and they accept CC payments. If your landlord doesn’t take CC’s, see if they’ll take a Visa gift card as payment. Point out that it’s better than having $1K (multiplied by the number of units they own) or more around, which can be lost or stolen. The point is rent, own, condo or commune, you should be able to use a CC to pay for your domicile. Go to silent auctions. The majority of the ones that I have gone to allow credit cards as the form of payment. I have gotten gift cards at 5-10% off and some included places that don’t take credit and so I got the points in addition to the discount. Many of the auctions are for a good cause and have many practical items, services or gift cards. Is your home insurance being escrowed? Call your mortgage company to see if you can take it off escrow and pay it yourself. Then pay it ahead. Pay your timeshare maintenance fees a little early or maybe your car insurance. I like the idea of paying property taxes! I call my insurance agent every month to put my premium on my favorite credit card. I like those “win-win” situations…giving $$$ to my favorite charities using a credit card. Any and all kinds of “taxes”. Here is the answer. Open a Square Card reader account. Use your card to charge whatever amount you want to yourself (or whatever entity you’d like – business, etc.) Then use those fund to pay your CC bill. Square will charge you a fee of approx. 2.5%, but you’ll have your spend covered. My dentist takes cc’s – how about prepaying next year’s teeth cleaning? @Joel That’s a great idea. Tell me more. So you find a refundable cruise line and before the 90 day window they’ll refund by check? I don’t know if you got any good tips on this comment thread, Rene, but I sure did! Prepay your EasyPass for next years tolls. Get the spend and the write-off in 2012! Do you have any home repairs or home maintenance that would require a trip to Home Depot or Lowes? Gift cards purchased for that reason and the repair will already have been paid for. How about gift cards as Christmas presents? My kids prefer gift cards to having to take back the wrong stuff I purchased as either birthday presents or Christmas presents! Every year around Thangsgiving, restaurants start offering freebies or extras with purchase of gift cards. I’ve been stocking up to the tune of a few hundred dollars in December, planning to buy about 6~9 months’ worth of dining at my regular restaurants. For example, Red Robin has offered up to 25% increase if you buy $400 worth of gift cars. I buy a $400 card, which becomes $500. Then I treat my neices and nefews when they visit. It’s 25% return on my investment, and mileage on my Delta AmEx. forgotthis one when kids in private school ($10,000 or more per child) they did not like it but paid tuition on it=$30,000 per year….. I plan to use my Amex to pay for a cruise 100@ that leaves in Jan/Feb 2013. My school tax $1900 for 6 months is due and depending on service charge, I will pay 100% this month. Prepaid $1725.00 for my propane gallons for next 7 months. Paid both my homeowner and auto insurance via AMEX. Pay for 40% of our groceries via Walmart via Amex. Paid for 3 weeks of time share exchange fees and annual maintenance fee via Amex. Using AMEX for car rental same trip. A couple of my friends are about to get married. I knew that they wished they could add a large gift to their registry, but knew no one would purchase the item. In fact they had planned on saving up to buy the item themselves after the wedding. So I reached out to other mutual friends, who like me don’t have a whole lot of money. We pooled our money and got them the big gift as a surprise, and one they’ll never forget. I paid for the gift up front on a points-earning card and then got reimbursed from everyone else via paypal or amazon payments. It’s a triple win scenario. The betrothed are happy. My friends made an impact for an easy and small investment, and I benefited with the points (I even went through a portal for a multiplier!). I think you should buy marriott GC if you have upcoming stays. Get 12k SW points or 5k united miles in the process. 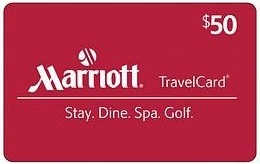 Pay using a Marriott rewards card if you have it to get an additional 5k points. And knock off a 1000$ in spend. Buy a new car, using $4500 as credit; most dealers with allow this.